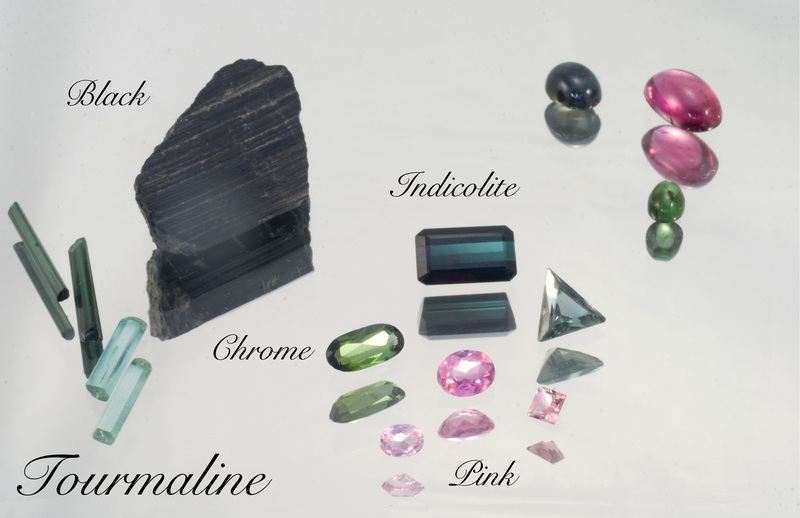 Tourmaline is reputed to be the only gem with “such richness in colour variation”! It has been found in every colour, hue and intensity imaginable. Not only are the pale pastels here, Tourmaline is also big and bold, bright and beautiful. This Aluminum Borate Silicate is modified by “complicated and changeable compositions.” What that means is it is slightly different in chemical composition in each colour that it displays. And it is harder than Quartz. Just like Quartz, Tourmaline is piezoelectric. That means it generates a voltage under pressure. Tourmaline is also pyroelectric meaning it develops that same type voltage under temperature change as well. So why isn’t it in every jewellers showcase? There are a few reasons for that. Primarily because monochromatic crystals are very rare. Almost all Tourmaline crystals vary from one tone or colour to another, sometimes dramatically. The Watermelon Tourmaline, green on the outside lined with white and then pink in the center is an fine example of how varied a single crystal can be. Secondly, because of the stones strong pleochroism the table of the gem must be cut along the length of the crystal to keep the colour strongest. If the crystal is very dark, smaller stones can be cut crosswise to lighten the finished gem but they will exhibit some colour change in different lights. The final reason they’re not popular in showcases is that they are very inexpensive compared to the “big three”, which they mimic all too well. As well, pink Tourmaline is an alternative birthstone for October. Tourmaline is found throughout the world with certain colours indicating the area of origin. If it’s a bi-coloured stone you can bet the mine it’s from is in Mozambique. Tourmaline has one more spotlight that it shares with Rutile.. It grows in clear Quartz and other material as long thin spikes. If the spikes are fine enough and orient at 120 degrees from each other, you have a Tourmalinated gem. One species of crystal grown inside another. We have them , set in Sterling Silver, in stock. Please feel free to come in and view our specimens and finished jewellery.